The song “John (Joan) to the Maypole” dates back at least to 1600, we know several text versions with the same title but also with different titles, (to “May-day Country Mirth”, “The Young Lads and Lasses”, ” Innocent Recreation “,” The Disappointment “) the first printed version dates back to 1630 when the melody is attributed to Felix White, and we find it in the collection” The Pills to Purge Melancholy “by Thomas D’Urfey c. 1720. 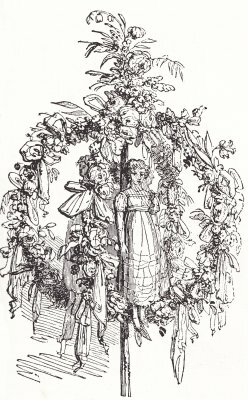 The song describes a typical May Day on the lawn: couples dance around the May Pole to contend for the coveted award, the May garland. The winning couple will become King and Queen of May. To organize May Day feast we need just a green, that is an open space outside the village, a well planted pole in the middle of the lawn, decorated with flower garlands, some “summer houses” where to sit in the shade and refresh with drinks. 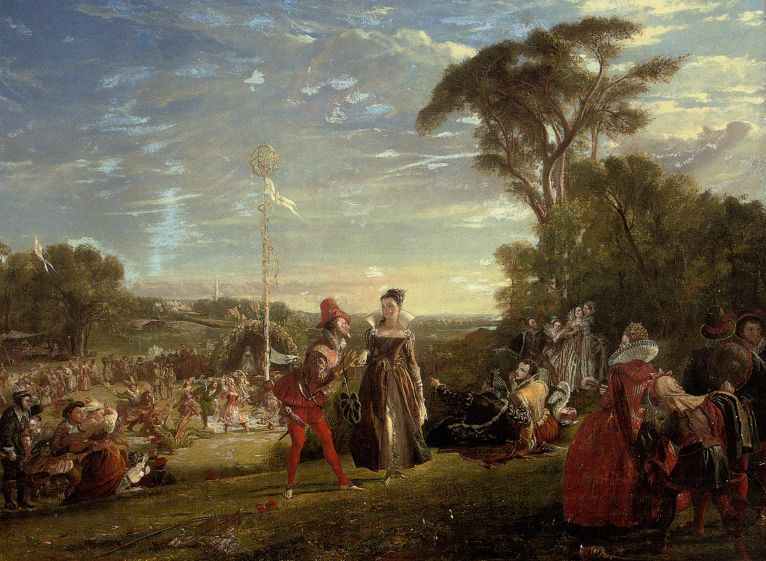 In the painting by Charles Robert Leslie we see a scene celebrating the May with Queen Elizabeth depicted on the right in the foreground while being entertained by a jester. On the expanse of the second floor stands the May pole decorated with green garlands; around the pole the dances are taking place and the characters dressed by Robin Hood, Lady Marian, Fra Tack, but also a seahorse, a dragon and a buffoon (the classic characters of mummers and Morris) are well distinguishable. 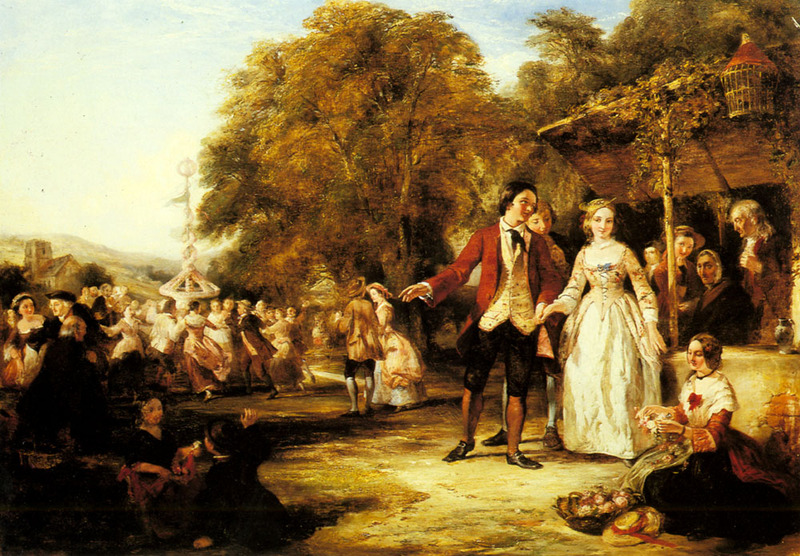 In the Victorian painting by William Powell Frith we find again the same situation described in the late medieval period: in the distance on the left stands out the profile of a church, not by chance: it was in fact the church that financed the May celebrations; with the beer sold, the parish church was maintained or the alms were distributed to the poor. The tune is from “Margaret Board Lute Book” (here) the manuscript in the private collection of Robert Spencer, has been dated c1620 up to 1636 (it seems that lady Margaret took lessons from John Dowland). and who can mend them? Walk along in his rich array? See how they meet and how they kiss. Tickle her, Tom, with a pipe and tabor!(2). As Robin, Jenny, Tom, or Nell. Thumped it about and gained the glory. I’ll make thee lady of the May. Turn and kiss, and then for a greeting. till the next merry meeting. 1) the exhortation refers to the musicians who are not yet ready with their instruments to kick off the dance. 4) it is not clear whether the election dethroned the previous couple immediately or is the title valid for the following year. 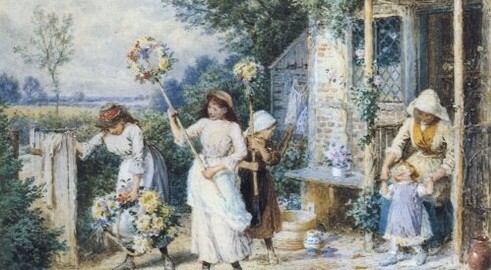 Amhrán Na Craoibhe (in englishThe Garland Song) is the processional song in Irish Gaelic of the women who carry the May branch (May garland) in the ritual celebrations for the festival of Beltane, still widespread at the beginning of the twentieth century in Northern Ireland (Oriel region). 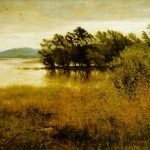 The song comes from Mrs. Sarah Humphreys who lived in the county of Armagh and was collected in the early twentieth century, erroneously called ‘Lá Fhéile Blinne‘ (The Feast of St Blinne) because it was singed in Killeavy for the Feast of St Moninne, affectionately called “Blinne“, a clear graft of pre-Christian traditions in the Catholic rituals. 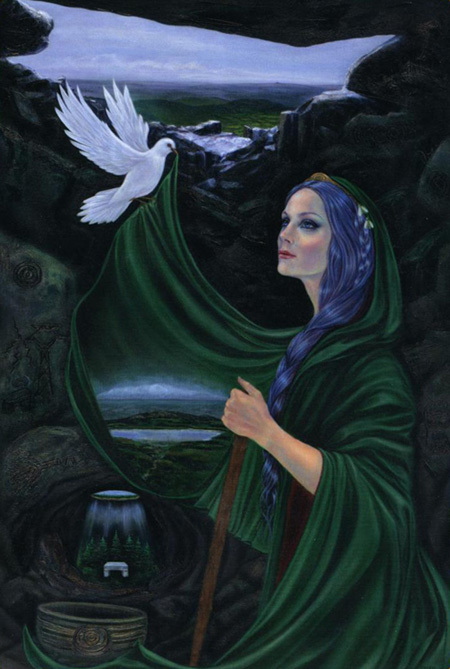 St Moninna of Killeavy died in 517-518, follower of St Brigid of Kildare, her names “Blinne” or “Moblinne” mean “little” or “sister” (“Mo-ninne” could be a version of Niniane, the “Lady of the Lake” of the Arthurian cycle); according to scholars her name was Darerca and her (alleged) tomb is located in the cemetery of Killeavy on the slopes of Slieve Gullion where it was originally located her monastery of nuns, become a place of pilgrimage throughout the Middle Ages along with her sacred well, St Bline’s Well. Slieve Gullion ( Sliabh gCuillinn ) is a place of worship in prehistoric times on the top of which a chamber tomb was built with the sunlit entrance at the winter solstice. (see). 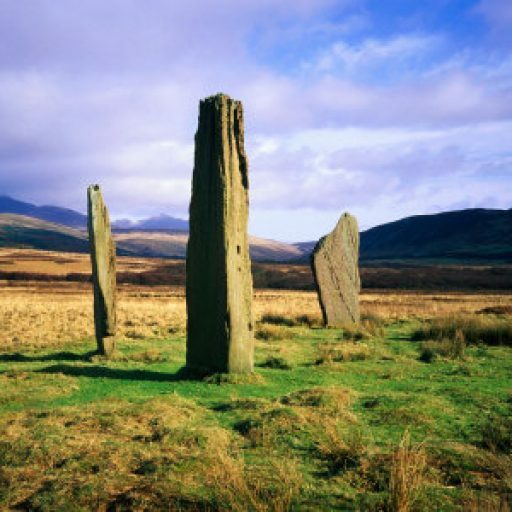 According to legend, the “Old Witch” lives on its top, the Cailleach Biorar (‘Old woman of the waters’) and the ‘South Cairn’ is her home also called ‘Cailleach Beara’s House‘. 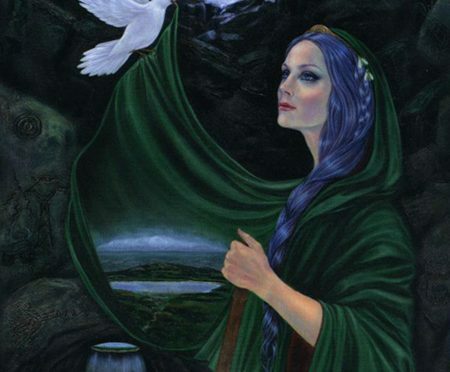 The Cailleach and Bride are probably the same goddess or the different manifestations of the same goddess, the old woman of the Winter and the Spring Maid in the cycle of death-rebirth-life of the ancient religion. The ancient path to St Bline’s Well. One of the most spectacular high-level views in Ireland. On a clear day, it’s possible to see from the peak (573 mt) as far as Lough Neagh, west of Belfast, and the Wicklow Mountains, south of Dublin. where will we get her a spouse? and back home to this place? we have always won it. cá bhfaigh’ muinn di nuachar? 5) derogatory sentences against other garlands carried by rival teams “a pig in a poke” is a careless purchase, instead of a pig in the bag could be a cat! The hawthorn is the tree of Beltane, beloved to Belisama, grows as a shrub or as a tree of small size (only reaches 7 meters in height) widening the branches in all the directions, in search of the light upwards. 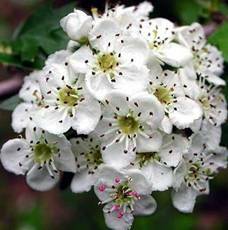 The branch of hawthorn and its flowers were used in the Celtic wedding rituals and in the ancient Greece and also for the ancient Romans it was the flower of marriage, a wish for happiness and prosperity. The flowers are small, white and with delicate pinkish hues, sweetly scented. In areas with late blooms for Beltane the “mayers” use the branch of blackthorn,same family as the Rosaceae but with flowering already in March-April. May day is called in Ireland the “na Beal tina” or “the day of the fire of Beal” consecrated to Bel or Belenos. On the eve large fires are lit and the cattle are passed between them – as was the ancient custom of the Celts – custom still conserved in the Irish countryside with the belief that this preserves cows from diseases and from Good People (wee folk). All hearths were extinguished at sunset and rekindled with the embers of the collective bonfire only the next day (and still today in Ballymenone county of Fermanagh). The cattle were then taken to the summer pastures, where they remained until Samahin, watching by a buachaill. Beltane is a crucial day in the season (Winter ends and Summer begins) and fairie can more easily make contact with the world of humans. 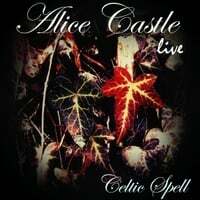 The eve is a day in which you have to pay the most attention, because the fairy people (Good People for the Irish) can be very spiteful and even the malefics are more effective. So no Irish woman would ever taking her newborn for a walk outside so as not to risk finding a challenger in return. In particular, youth and beauty can arouse the envy of fairies and therefore even the beautiful girls are indoors. In general it is popular belief that illnesses or injuries occurring on the May Eve are the most difficult to cure. So it is a good idea to always leave the house with an iron amulet around your neck or in your pocket and leave an offer of food to the fairies! Mummers were typical beggars during the nineteenth century, masked figures equivalent to the English Morris dance. Thomas Crofton Croker in “The Fairy Legends and Traditions of the South of Ireland” (published in 1825) reports many Irish traditions of May and describes precisely the May Mummers; in short, Croker tells us that during his trip to the south of Ireland he witnessed the May festival, which is the favorite of the Mummers: a group of girls and boys from the village or neighborhood who march in procession in a row for two, the men are dressed in white with brightly colored jackets or waistcoats and carry colored ribbons on their hats and on their sleeves and even the women are dressed in white or in light colors. A pair of girls carries a holly bush for each, decorated with many colored ribbons with hanging many new hurling balls (a popular sport that begins in May), a May gift for young people in the village. The procession is preceded by musicians, bagpipes or pipes and drums. There is a clown wearing a scary mask and bearing a long pole with scraps of fabric on top (like a broom) that plunges into the water and shakes it around the crowd to keep the little ones entertained. The masks parade through the villages or go from house to house dancing to receive money and spend the evening with a cheerful and colossal drink. May Pole and the dances around the pole are quite common in Ireland, Holywood town in Northern Ireland is famous for its May tree erected in the middle of a crossroads: according to local tradition it dates back to 1700 (taken from the mast of a ship) and is still a place for dances to the annual May festival. But the most typical custom is to cut a branch of hawthorn (or rowan) and plant it next to the door or put it on outside the door, making a garland with yellow flowers (primroses, marigolds and buttercups) and colored ribbons. 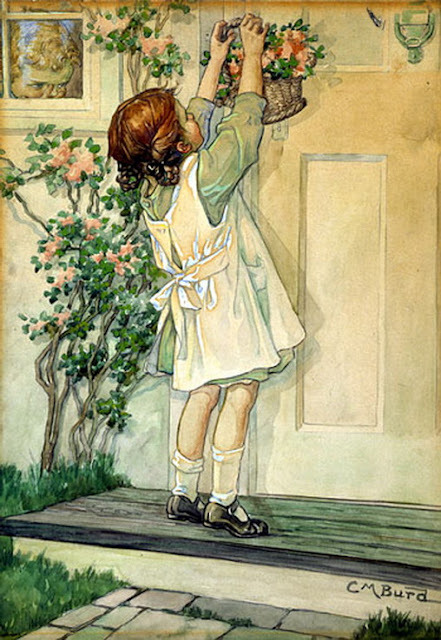 From this tradition was born the May basket crafted by the childrenand and filled with fresh flowers, to be left – secretly – next to the door of the neighbors or beloved one. 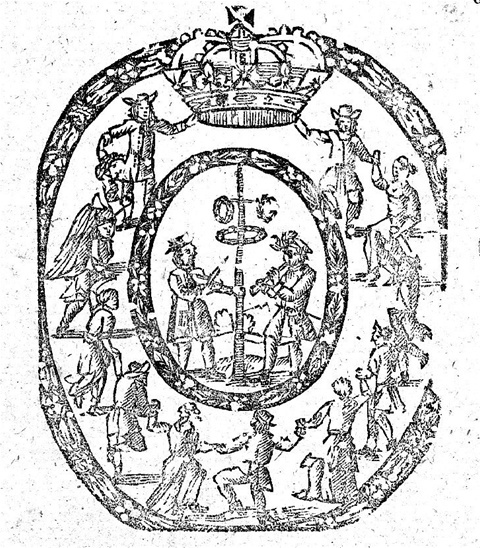 With this auspicious token, the inhabitants are protected from fairies, because fairies cannot overcome these flowered barriers. The herbs harvested before sunrise in May Day have better healing properties especially to treat warts. When butter production was a homemade churning process, the first butter produced with milk from May Day was considered the best to prepare ointments. Nettles once rivaled linen and hemp as weaving fiber, for sails, clothes and household linen. 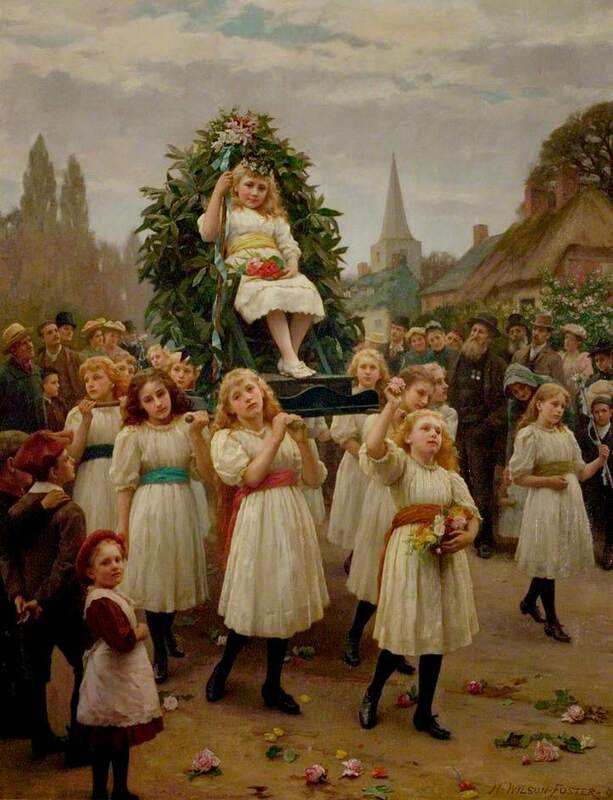 May traditions have been preserved in various parts of Europe until the twentieth century: in England it was drastically interrupted at the outbreak of the First World War, it was taken sporadically and kept alive by many Mummers and Morris Dancers, until today. 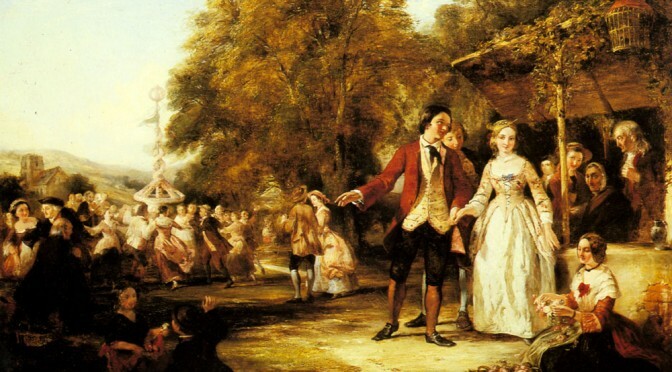 Generally, as was the ancient tradition, the youngsters of the village went to the woods to pick up the branches of May, (“going a-Maying“), and to bring the May to the country (“the bringing home the May“), mostly dressed up or with costumes extravagant: there were a couple of newlyweds and other figures even more picturesque with special names depending on the place and tradition. 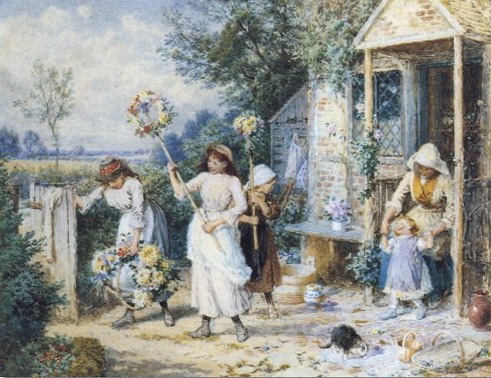 In the nineteenth century the Mummers in Ireland and Brittany took part in the May festival both in the begging songs and to bring May and dance around the May Pole. Are dressed in ribbons fair. In the blue veil of the night. We bring a garland gay(2). In the springtime of the year? Long past their woodland days. Round in circles and in rows. When all the shades are gone. And at your door we stand. The work of our Lord’s hand. “… In the springtime of the year on the night electrifying the youth, young people rush for to sing May under the windows of their favorites.At the same time, you can hear a lot of young girls singing songs by placing on their windows and their doors tree branches with flowers, that is they have planted the May “(Placucci – 1818). 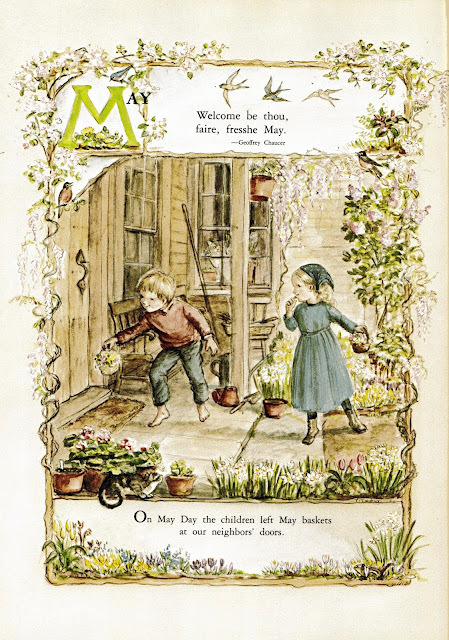 In England throughout the nineteenth century, various may songs dating back to popular tradition are documented: the Mayers began their itinerant beggin in mid-April singing the May, and ended on the evening of April 30th. They was in small groups of five or six men who accompanied themselves in singing with the violin or flute. 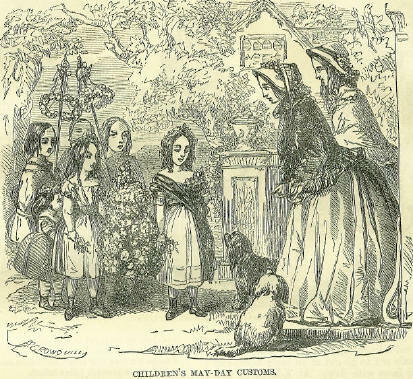 These Mayers are the echo of the cheerful brigades that since the Middle Ages brought the May into the houses: a “Queen of the May” was elected among the most beautiful girls in the village and they danced and singed together around the May Pole. 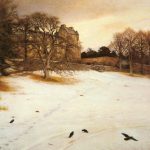 The Mayers wandered both during the night and during the day and had songs for the night and songs for the day often on the same melody. The Night songs were sung on April 30 to leave the May branches at the doors of their neighbors with the request for food and drink. The Day songs were the songs of the 1st of May those more properly of begging in which they asked for coins in exchange for good luck songs. Also the children were wandering the streets, as for the Wassaling and the Christmas caroling even in spring the children went from house to house for begging, singing a series of verses (learned from the mother): they carried in procession the May garland with a little doll placed between a wreath of flowers and ribbons hanging from a pole (see) and receiving coins and some food-drinks in exchange for the auspicious verses. Nel Medioevo prima dello spuntare del giorno di Calendimaggio i giovani del villaggio raccoglievano fiori di campo, rami di biancospino e facevano entrare il Maggio nel paese: cantavano, danzavano, appendevano alle finestre i rami raccolti e donavano i fiori alle fanciulle più graziose. Festeggiare il Maggio era una consuetudine anche dei nobili per tutto il tardo Rinascimento come ci mostrano i molti dipinti dell’epoca. Nel dipinto di Charles Robert Leslie è raffigurata proprio una scena celebrativa del Maggio con la Regina Elisabetta raffigurata sulla destra in primo piano nel mentre è intrattenuta da un giullare. Sulla distesa in secondo piano si staglia il palo del maggio impavesato e decorato con ghirlande verdi; attorno al palo si stanno svolgendo le danze e sono ben distinguibili i personaggi vestiti da Robin Hood, Lady Marian, Fra Tack, ma anche un cavalluccio, un drago e un buffone. Sempre sullo sfondo è raffigurato anche una specie di pergolato ricoperto di fiori e fronde, a forma di grotta dentro il quale si intravede una figura di donna: è la regina del Maggio, la rappresentazione vivente della dea Flora, protetta e appartata rispetto alla zona in cui si svolge la festa, quasi una reliquia, oggetto di ammirazione dei nobili e dei popolani. Le coppie danzano intorno al Palo del Maggio per contendersi l’ambito premio, la ghirlanda del Maggio, e diventare l’anno seguente il Re e la Regina del Maggio. Ed ecco che nell’Ottocento in Inghilterra ritroviamo la regina del Maggio effigiata in una bambolina posta tra una corona di fiori e nastri appesa ad un’asta portata in giro dai Mayers (i maggiolanti). Si tratta della “piccola Bride” la dea triplice celtica la fanciulla del grano confezionata dalle donne a Imbolc (il primo febbraio) con il grano avanzato dall’ultimo covone della mietitura dell’anno passato, ossia la giovane Fanciulla della Primavera, un forte simbolo di rinascita nel ciclo di morte-vita in cui si perpetua la Natura: nella bambolina si era trasferito lo spirito del grano che non moriva con la mietitura. Come per il Wassaling e il caroling natalizio anche in primavera i bambini andavano di casa in casa per la questua, cantando una serie di versi (imparati dalla mamma) e mostrando la Ghirlanda del Maggio. 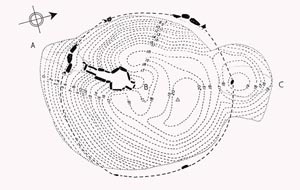 Nell’Ottocento la connotazione della questua era decisamente più ossequiosa della Chiesa, con versi da penitenti e la bambolina intesa come rappresentazione della Vergine Maria. Tradizioni che si sono conservate in varie parti d’Europa fino alle soglie del Novecento. In Italia ad esempio le cronache del tempo riferibili alla Romagna (vedi) “…nella notte d’ingresso di tale mese, elettrizzandosi la gioventù, accorrono i giovani a cantare il maggio sotto le finestre delle loro favorite. Contemporaneamente si sentono torme di giovinette cantare canzoni ponendo sulle finestre ed alle loro porte rami di albero con fiori, come dire di avere piantato Maggio” (Placucci – 1818). “il primo giorno di maggio gli amanti prendono un ramo di acacia in fiore e vanno la mattina per tempo a piantarlo o presso l’uscio, o vicino ad una finestra dell’amata: alcune volte attaccano a questo ramo doni come spille, fazzoletti o altro. Poi cantano” (Bagli – 1885). Il brano potrebbe risalire al tardo Medioevo e la sua prima traccia si trova nei festeggiamenti popolari per lo sbarco di James Butler Duca di Ormonde nel 1662, nominato Lord Luogotenente d’Irlanda. 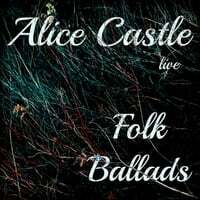 E’ un canto tradizionale nella parte sud-est dell’Ulster (Irlanda del Nord) ed era cantato da gruppi di giovani che andavano di casa in casa a portare il ramo di Maggio (mummers, mayers- vedi). 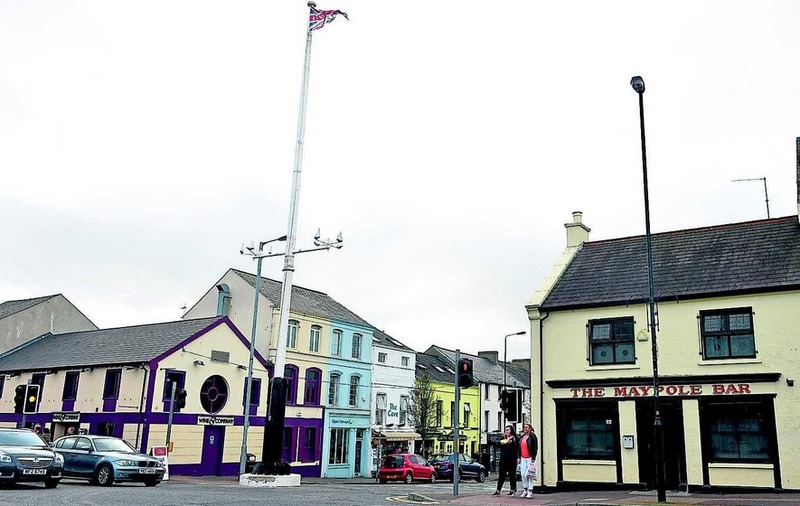 Il brano è ancora molto popolare in Irlanda in particolare nella regione di Oriel (che include parti delle contee di Louth, Monaghan e Armagh) ed è eseguito sia in versione strumentale che cantato. Edward Bunting afferma che il brano era suonata nell’area di Dublino fin dal 1633. The Chieftains , questa versione strumentale è un inno alla gioia, un canto di uccelli che si risvegliano al richiamo della primavera: inizia il flauto irlandese appoggiandosi all’arpa, che trilla nel crescendo (a imitazione del canto dell’allodola) ripreso in canone dai vari strumenti a fiato (il flauto irlandese, il whistle e la uillean pipes) e dal violino, grandioso! Áthas do lá is bláth ar chrann. and the flower on the trees. 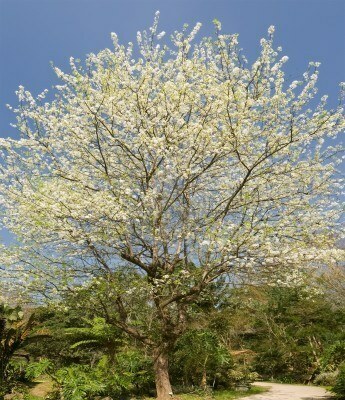 1) la Bábóg è la bambola (fanciulla) di Primavera. Brídeóg era la “piccola Bride“, (Brigit, o Brigantia in Britannia, una dea trina -Vergine, Madre, Crona) tra le più importanti del pantheon celtico, la fanciulla del grano confezionata dalle donne a Imbolc (il primo febbraio) con il grano avanzato dall’ultimo covone della mietitura dell’anno passato, ossia la giovane Dea della Primavera, un forte simbolo di rinascita nel ciclo di morte-vita in cui si perpetua la Natura: nella bambolina si era trasferito lo spirito del grano che non moriva con la mietitura. 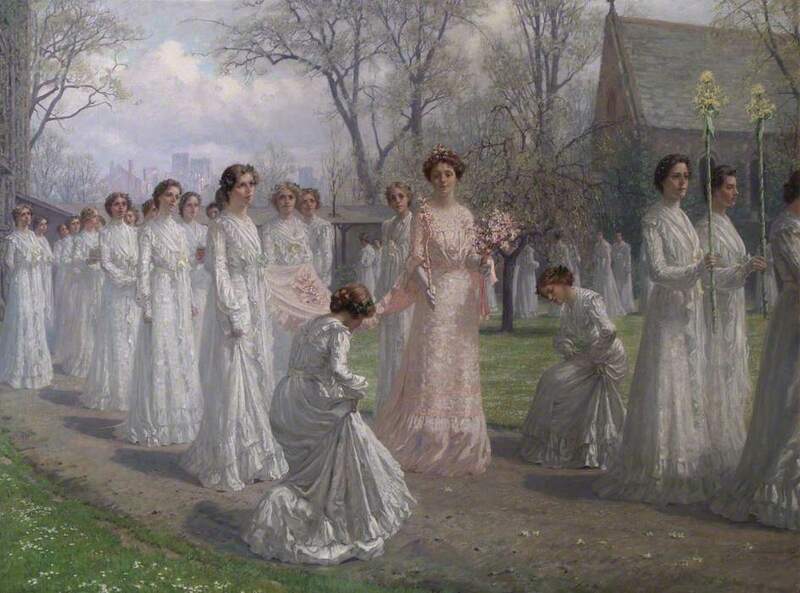 Le bamboline di Brigid venivano anche vestite con un abito bianco o decorate con pietre, nastri e fiori e portate in processione per tutto il paese affinchè ciascuno lasciasse un dono alla piccola Bride. 4) i fiori che venivano raccolti erano per lo più gialli per richiamare il colore e il calore del sole. Fiori e rami fioriti erano posti sulla soglia di casa e ai davanzali delle finestre per proteggere gli abitanti dalle fate e come auspicio di buona sorte. Era convinzione che le fate non potessero superare tali barriere fiorite. Tale tradizione era tipica dell’Irlanda del Nord. I bambini soprattutto andavano a raccogliere i fiori selvatici per preparare delle ghirlande, specialmente con fiori dal colore giallo. 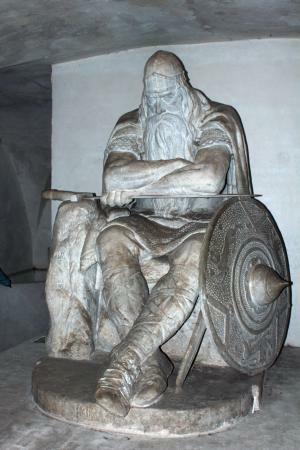 is thugamar féin a’ samhradh linn. ’s thugamar fhéin an samhradh linn. and we bring the Summer with us. and we brought the summer with us.